Austrian Romance philologist; born at Spalato, Dalmatia, Feb. 15, 1835. 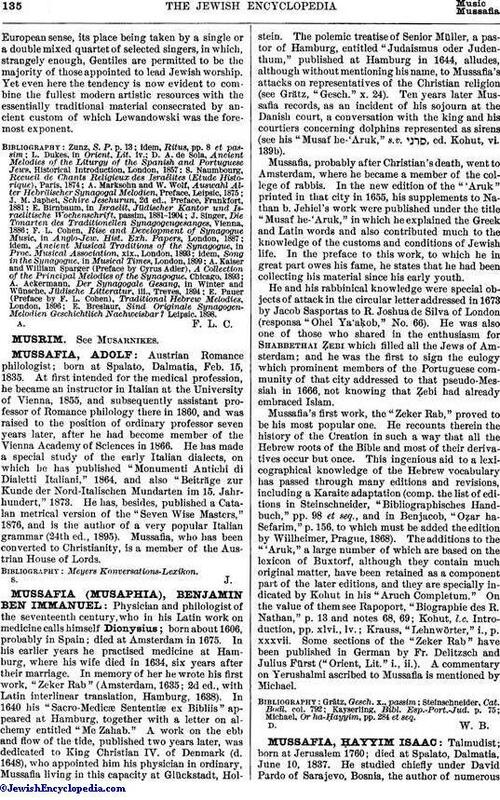 At first intended for the medical profession, he became an instructor in Italian at the University of Vienna, 1855, and subsequently assistant professor of Romance philology there in 1860, and was raised to the position of ordinary professor seven years later, after he had become member of the Vienna Academy of Sciences in 1866. He has made a special study of the early Italian dialects, on which he has published "Monumenti Antichi di Dialetti Italiani," 1864, and also "Beiträge zur Kunde der Nord-Italischen Mundarten im 15. Jahrhundert," 1873. He has, besides, published a Catalan metrical version of the "Seven Wise Masters," 1876, and is the author of a very popular Italian grammar (24th ed., 1895). Mussafia, who has been converted to Christianity, is a member of the Austrian House of Lords.